Landless: Bring on the Girls! When the great humorist P.G. 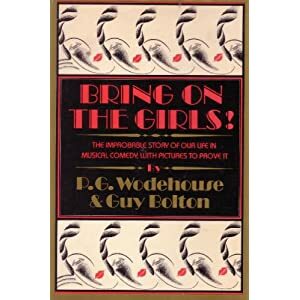 Wodehouse was writing Broadway musical comedies in the 1920's, he and his collaborators, Jerome Kern and Guy Bolton, had a string of huge hits. Wodehouse was one of the funniest writers ever, which certainly helped; he helped write such enduring hits as "Anything Goes" and "Show Boat". However, they also understood the craft and the business of the theater. As the Wodehouse-Kern-Bolton team put their shows together, there would inevitably be snags. When the plot hit a big slump, a massive slowdown that took the energy out of the show, they followed a simple rule: "bring on the girls". They would re-write that part of the play to break up the dragging scene and have a rousing dance number with short skirts and high kicks. This advice is not so very different from that given by Raymond Chandler: "When in doubt, have a man come through a door with a gun in his hand." Last night, in my editing of "Goodbye Grammarian", I was faced with a long, tedious infodump, a big technical plop of backstory. Remembering the advice of Wodehouse and Chandler, I broke the scene up abruptly. After one character asked another, "But where did all this high tech equipment come from? ", instead of continuing with the original infodump, I had the conversation break off abruptly, right on the jagged edge between question and answer. I rewrote the scene to lead them into the kitchen, where gracefully waving robot arms made a nice lunch and poured delicious hot tea. The infodump about the backstory can still come later, but changing the subject and walking on some robotic razzle-dazzle breaks things up nicely. Leaving the questions hanging unanswered also makes the answers more interesting when they finally come a couple of pages later.